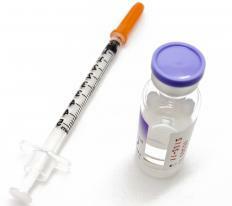 Botox®, which is sometimes used to treat torticollis. Torticollis is a condition also known by the names loxia and wry neck. It can occur at birth, in which case it is called congenital, or it may happen at another time of life and be called acquired. The symptoms of this condition are fairly easy to recognize because the head is leaning in an opposite direction to the chin, or rather the head goes down to the side as the chin comes up on the other side. In addition to the incorrect positioning of the neck, other problems might be present. People may have difficulty moving their necks much at all, and they might have pain in the neck. Headache and tremors in the head may occur too. In acute cases, one shoulder may be higher than the other. Causes of torticollis are varied. In infants born with this condition, what may have occurred is improper womb positioning, so that neck muscles didn’t develop equally; this may be more common in multiple births where crowding occurs. Alternately, damage to the neck might have occurred during or before birth, and created the condition. Another potential causal factor in congenital torticollis is failure for the bones in the neck to form properly. Acquired torticollis usually springs from other causes. These may include trauma or damage to the nervous system and nerves controlling neck and head movement. Sometimes muscle injury takes place and results in the condition. How to treat loxia can very much depend on its underlying causes. Infants with muscle damage may be worked with on a daily basis to provide gentle stretches that can help develop the inadequate muscles. Sometimes braces are utilized to keep the neck supported in an upright position. Less aggressive forms of treatment are not always appropriate and some infants have such severe cases that they may require surgery to stretch the shorter muscles or to correct abnormalities in bone structure. Yet since these often mean spinal surgery, people are very often afraid of the potential to damage the spinal cord. Though due caution is recommended, doctors (usually pediatric neurosurgeons) who perform these surgeries are generally quite capable, and have trained for a significant time to operate on very young children. In acquired torticollis, treatment may not involve surgery very often. Instead, methods of healing could include loosening neck muscles through things like massage or heat. Sometimes a brace or some form of traction might be required to correct neck positioning. Another treatment common is Botox injections, or a medication called baclofen. These may help relax nerves so that the neck doesn’t spasm or exaggerate the sideways lean. What is a Wry Neck? What are the Different Types of Neck Lump? Is Infant Chiropractic Care Safe?